Buttery Gnocchi and Boar Sauce Pappardelle, Anyone? 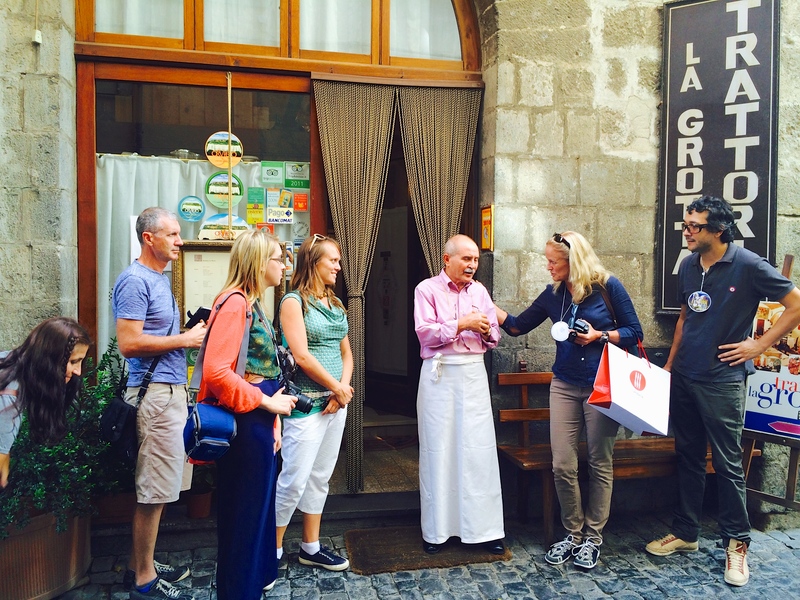 We hit a goldmine….of delicious and authentic Italian food, that is. 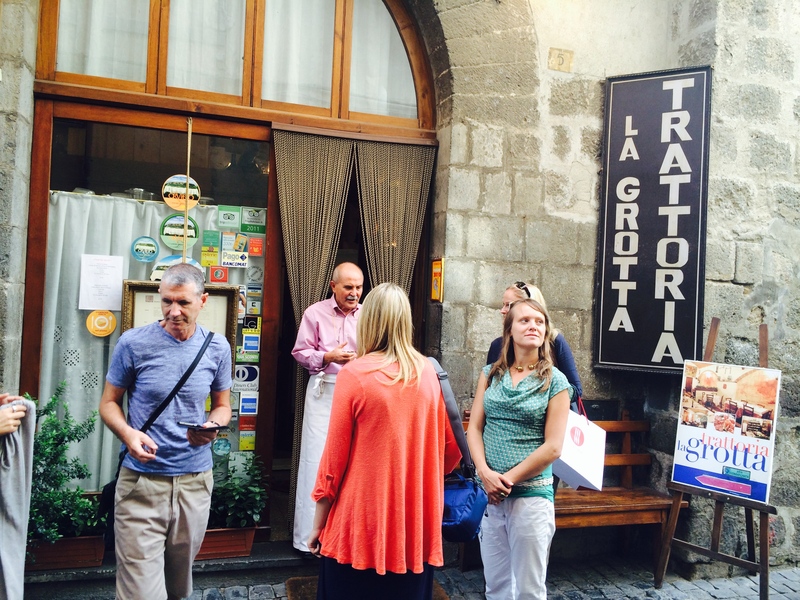 My blog tour group, This Is Your Time, had just arrived at Trattoria La Grotta for lunch. We had previously toured the famous Orvieto Cathedral with its striking Luca Signorelli frescoes that spanned over the gothic interior of one chapel. It seemed only right to turn down the old cobbled street Via Luca Signorelli after we left the cathedral. And there we found our memorable Trattoria. Franco, the proprietor, met us at the front door dressed in a crisp red checkered shirt and white apron that almost touched the ground. With warm handshakes, he quickly took us inside and sat us at a table that accommodated our entire group. The interior was a cellar-like space with intriguing yet subtle Picasso-esque murals on the walls. 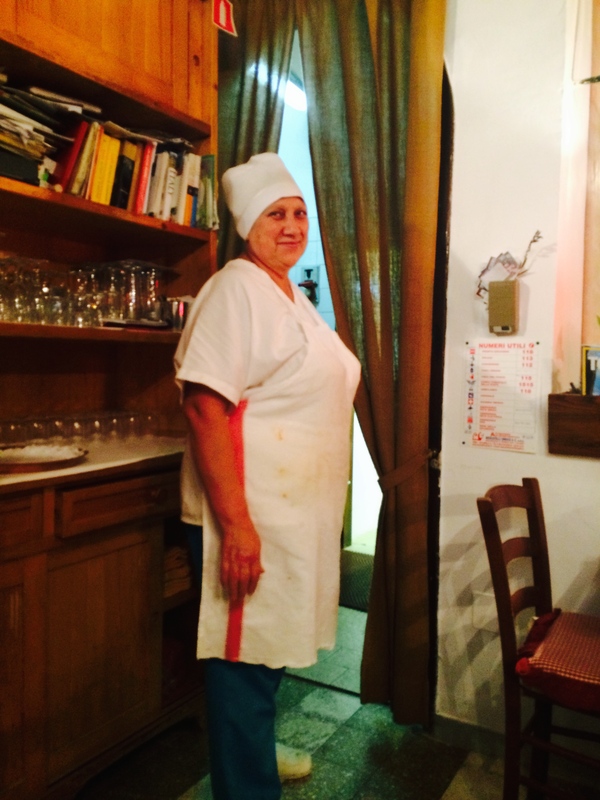 We learned that Franco had operated his trattoria here for nearly 30 years, with a steady American clientele as well as a local following. Proud yet gracious, Franco described some of the dishes on the menu. 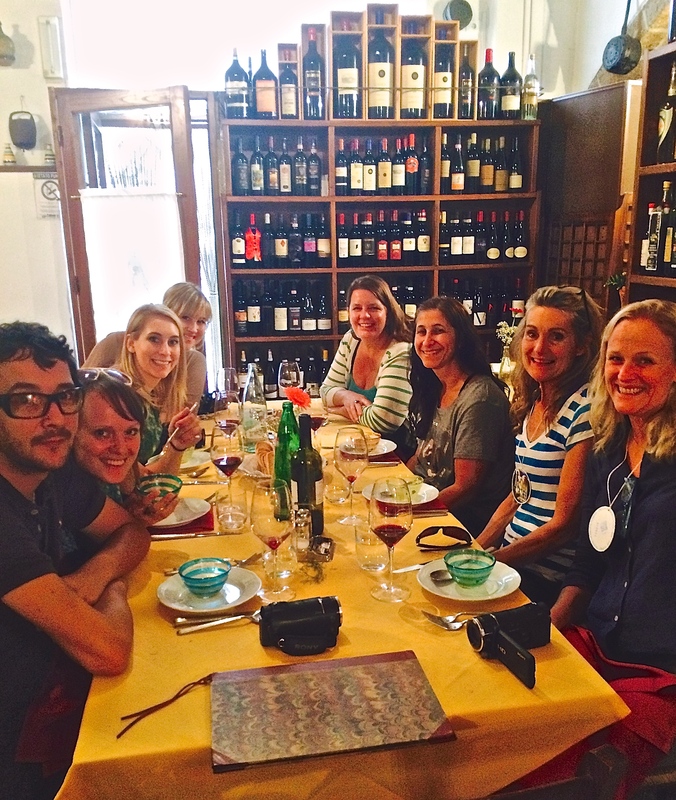 His knowledge of local Italian wines was superb, and we took him up on his recommendations. The red wine was delicious and a perfect match for our meal choices. The menu items feature grilled meats, pasta and fresh vegetables featuring the traditional flavors of Umbria. 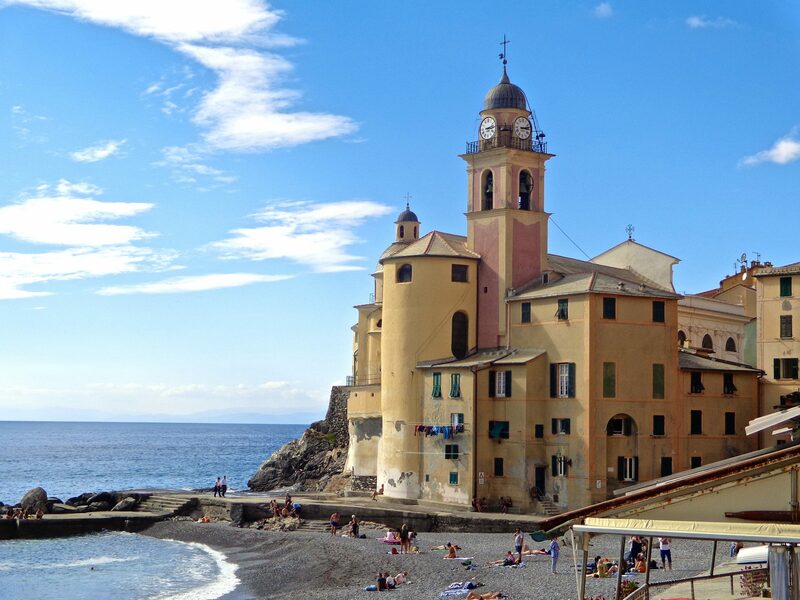 Most all of the ingredients, from homemade pasta to extra virgin olive oil, were locally grown or made. Gluten free options are possible if discussed with the staff. We were served a mouth-watering plate of steak bites. It was sauced just right, tender and succulent. 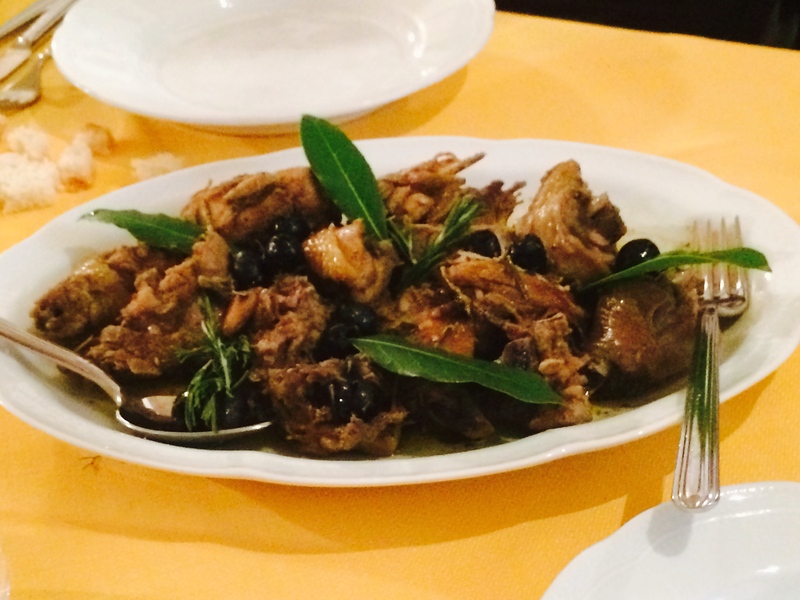 Before long, a large serving of chicken with local olives arrived. Spiced perfectly, not a piece was left over. 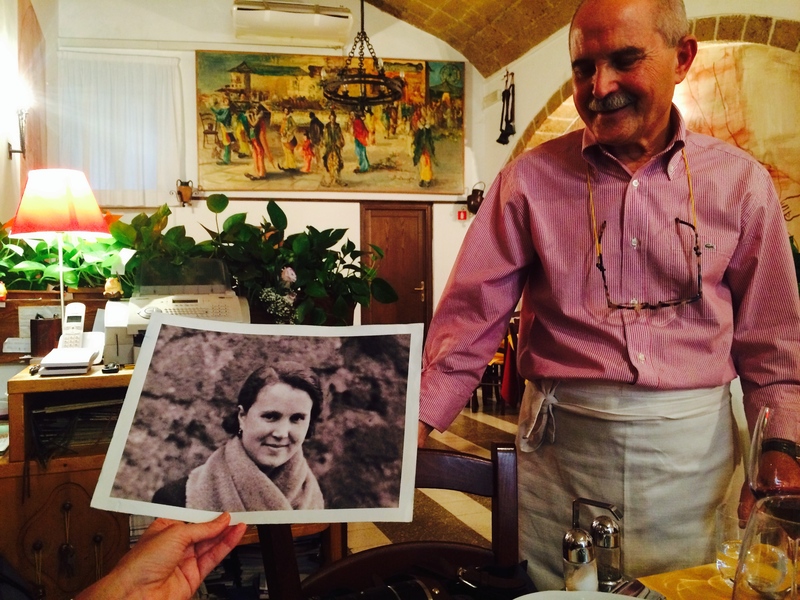 During our meal, Franco shared the history of his trattoria and the people over the years who had graced his tables. He brought out several photos to share from his beloved collection and passed them around the table. He had a story to tell about each one. Among them was a photo of his lovely wife. With soft eyes, he spoke tenderly of his strong love for her. Franco and his staff soon brought more plates of food. We were beginning to feel full but found the room to squeeze in pappardelle with wild boar sauce and buttery gnocchi. His staff was all smiles. Personable and friendly, we felt extremely well taken care of. The chef made a quick appearance at our request. We gave her a round of applause and praised her culinary skills. We said our goodbyes to Franco and promised we would revisit him one day soon. As we walked up the street to our next destination, our hearts and tummies were warmed by a joyful contentment that is not easy to find. It was simply the result of a personal touch, authenticity and warm regards from a proprietor and staff who valued quality and professionalism. Signorelli would be proud. ← Italy Magazine Blog Awards 2014~ It’s Time to Vote! 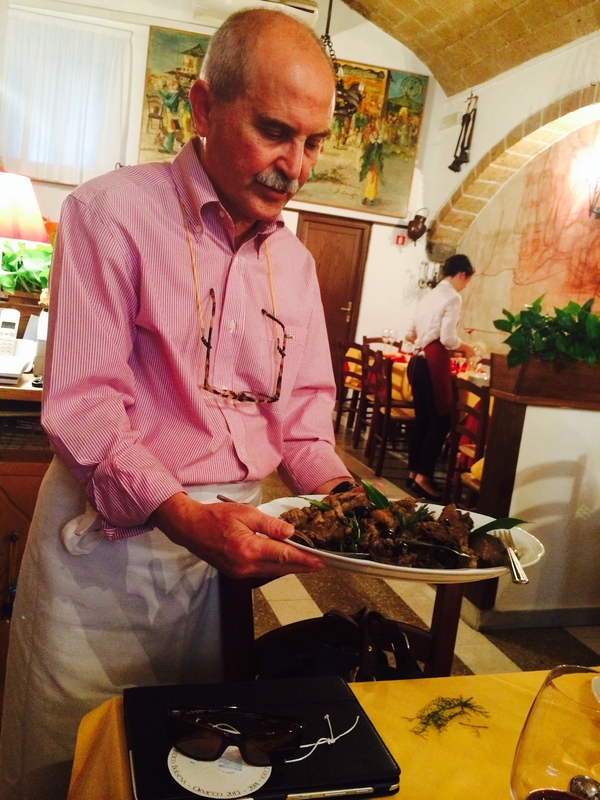 Being an Italian wine lover, do you remember what you had with the meal that he recommended? Wild boar is one of my favorites that I always look forward to enjoying when I can. And mine! It has a wild flavor unlike anything else that I really like. 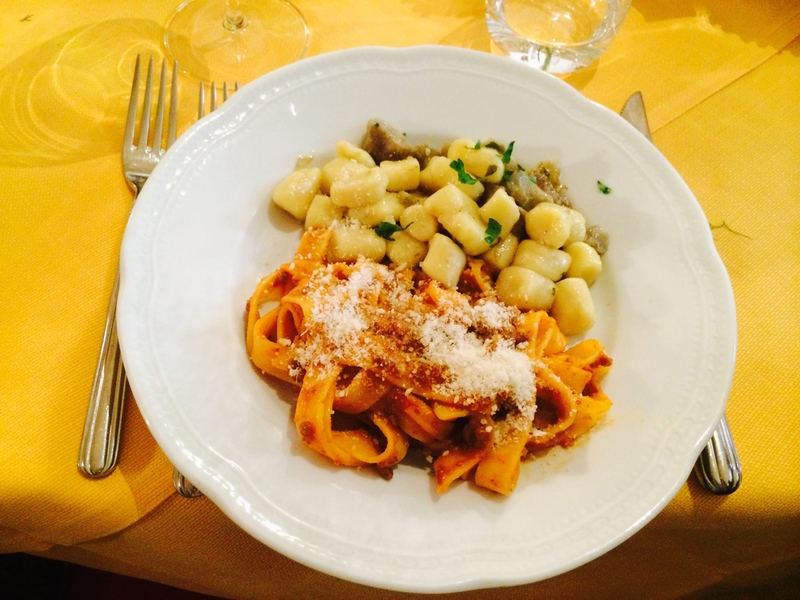 Whenever i’m in Italy I make it a point to have boar sauce pasta! A great article, my clients would also like to see more – could we collaborate? Always sounds so delicious, doesn’t it. I know! Good food is a luxury that seems to be more enjoyable as we get older! 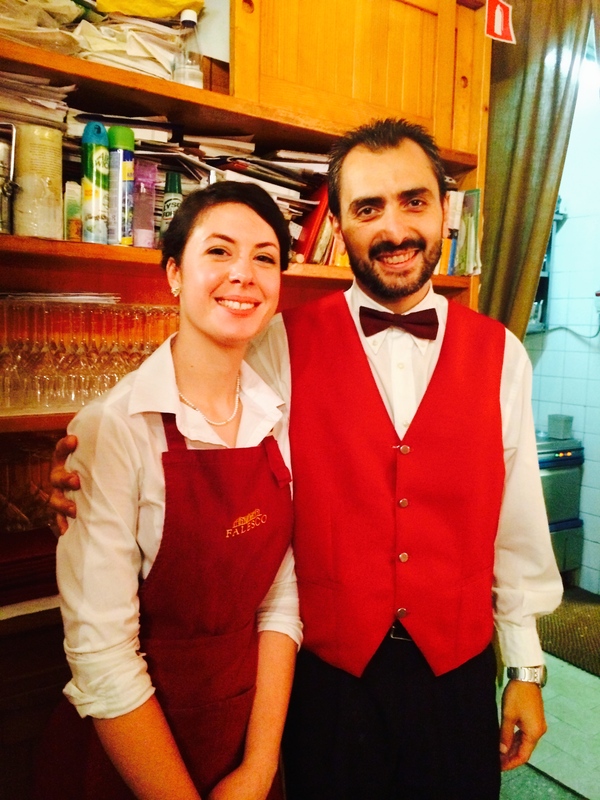 Thank you Lyn….these little family run trattorias are memorable. The personal touch and authentic delicious food is unforgettable.